Live eels are highly effective for catching striped bass, cobia, and other saltwater fish in the Chesapeake Bay, Delaware Bay, and coastal areas throughout the Mid Atlantic. In many areas, live eels are available at tackle shops. For striped bass, cobia, and other fish, small eels are preferred. Eels must be kept cool and moist, but do not do well in bait tanks. They are traditionally stored in wet newspapers, which are placed on top of ice. This storage method keeps the eels in a relaxed state so that they can be handled. When storing eels, it is important that they are not allowed to come into direct contact with the ice or be submerged in ice water. Because of their excess coating of slime, some anglers use gloves or place live eels in a bucket of sand before handling them. 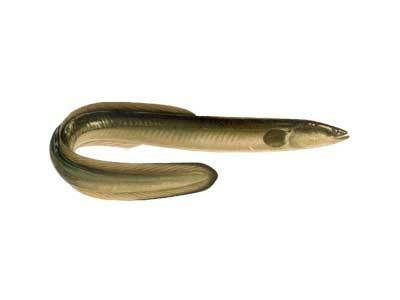 The most popular setup for fishing live eels is the Carolina rig. The rig can be casted easily and resists tangling, which is critical for these baits. Eels are usually fished with a loose drag, which allows fish to take line for several seconds before the hook is set. Opinions vary concerning the best type of hook for fishing with live eels. Some anglers choose traditional live bait hooks, while others use circle hooks. One issue involving the use of eels as bait is deep hooking. When large fish such as striped bass or cobia take a live eel, the bait is usually swallowed whole. Most styles of hooks tend to hook fish in the stomach or throat, which can cause serious injury to fish. Although some anglers report lower hookup rates with circle hooks, they are proven to reduce deep hooking when used with live baits. Because of their tendency to deep hook fish, the use of live eels for bait is prohibited in some fisheries.